Sinister X5 Technology 1) New fixed outriggers, move the strap position forward providing a perfect fit with your 509 helmet. Our unique edge pressure outrigger, provides a perfect seal along the outer edge of the goggles, not 2" in at the outrigger post like our competitors. This ensures a perfect fit & seal and eliminates fogging. 2) The X5 frame was carefully engineered with PHANTOM frame technology. 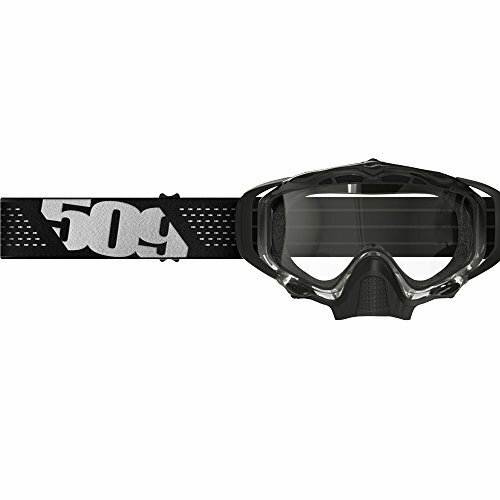 This unique design allows the goggle frame to disappear out of your field of view, leaving a clear vision path with less visible frame. 3) The new X5 is 1/2" taller and than our original Sinister and has been carefully re-engineered for greater field of view and a perfect fit inside your 509 helmet. This new design also eliminates nose pressure allowing unobstructed breathing. 4) The X5 features an all new Italian sourced Polycarbonate dual lens with greatly improved anti-fog coating and with a significantly more durable anti-scratch coating. Experience the difference of the X5, Italian sourced optical lens. 5) The X5 features a restyled, oversized and removable nosemask to keep you warm & comfortable. Its simply the best nosemask in the game!